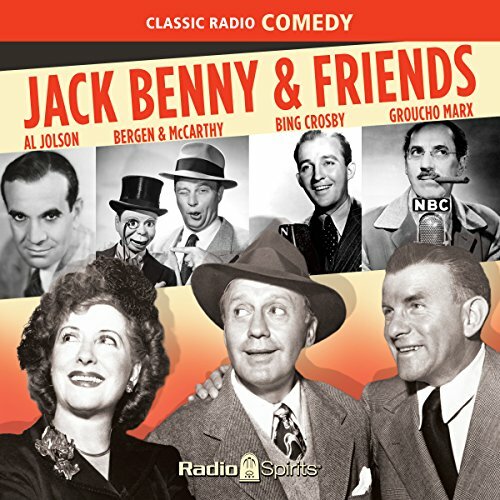 Jack Benny - he's your friend, my friend, and everyone's friend besides! He's always got his tried and true gang to pal around with, too, but that's not all! Throughout the 1940s and '50s, buddies from Burns & Allen to Bogie & Bacall came to play on his program. There were hilarious guest appearances by kings of comedy (Groucho Marx, Danny Kaye, and Red Skelton) and queens of the screen (Rita Hayworth, Barbara Stanwyck, and Dorothy Lamour). And don't forget legends Al Jolson, Jimmy Stewart, and Bing Crosby. This collection includes 16 digitally restored and remastered episodes of the funniest and most famous friends of all time. Episodes include: Guest: Dorothy Lamour, 11-15-42; Guest: Groucho Marx, 02-20-44; "Jack Gets Mad and Goes Home", 12-03-44; "From San Francisco", 05-20-45; "Weekend at the Acme Plaza", 04-07-46; "Jack and Mary Walk to the Studio", 10-13-46; Guests: Humphrey Bogart and Lauren Bacall, 01-05-47; "Gracie Wants to Listen to Jack on the Radio", 01-12-47; "From San Francisco", 03-30-47; "Sorry, Wrong Number", 10-17-48; "Lunch at the Brown Derby", 01-09-49; Guests: Edgar Bergen, Charlie McCarthy, Red Skelton, and More, 09-25-49; Guest: Al Jolson, 04-02-50; Guest: Douglas Fairbanks, Jr., 01-28-51; "The Life of Bing Crosby", 02-15-53; "All American", 11-08-53. Would you listen to Jack Benny and Friends again? Why? yes because its good old fashioned laughs with lots of movie stars of yesterday! made the time pass quickly and painless!